Αρχική Bugatti Βρέθηκε σε γκαράζ μία Bugatti Type 57S Atalante του 1937 !!! Βρέθηκε σε γκαράζ μία Bugatti Type 57S Atalante του 1937 !!! Τρελό και όμως αληθινό!!! Ο Dr Harold Carr στην διαθήκη του που άφησε, έγραψε συγκεκριμένα : “Στα ανίψια μου αφήνω το γκαράζ μου” . Στην ζωή του ο Dr Harold Carr ήταν εκκεντρικός άνθρωπος και σίγουρα οι κληρονόμοι του δεν χάρηκαν και ιδιαίτερα όταν διάβασαν την διαθήκη, αφού τους άφησε μόνο το γκαράζ του. Έλα όμως που ανοίγοντας το γκαράζ βρέθηκαν μπροστά σε μία Bugatti Type 57S Atalante του 1937 !!! One of the most important motor cars in the world emerges from its secret hideaway for the first time in 50 years. The 1937 Bugatti Type 57S originally owned by Earl Howe, whose existence has only been known to a handful of people during the last 50 years will be sold at Bonhams’ Retromobile sale in Paris on 7 February 2009. This highly significant motor car is conservatively estimated to realise in excess of €3,000,000. The Bugatti with Atalante coachwork retains all the attributes that will ensure its appeal to the world’s most discerning collectors. It has a spectacular provenance having been owned by Earl Howe, Lord Ridley, Harold Carr and others; it has a continuous and chronicled history; and it has exceptional originality retaining original chassis, engine, drivetrain and body. It even has what appears to be a remarkably low mileage with an odometer reading of just 26,284. Bugatti Type 57S, chassis no. 57502, was completed at the Bugatti works on 5 May, 1937 sporting two-seat Atalante coupe coachwork. It was ordered new by no less than the motor sport great – and the BRDC’s (British Racing Driver’s Club) first President – Earl Howe via UK Bugatti agents, Sorel of London. Howe had a long association with Ettore Bugatti and his machines, and developed a close friendship with Ettore and his son Jean, having raced their Grand Prix motor cars. Earl Howe took delivery of 57502 on the 9 June 1937 and was to retain his Bugatti for over eight years. He added a personal touch by fitting his own bumpers, rear-view mirrors on the A-pillars and a luggage rack, which it still retains to this day. It was to become his personal companion, escorting him to Brooklands and other race meetings. The car would have seen relatively little use during the Second World War as Earl Howe served with the Royal Navy Volunteer Reserve. After hostilities ceased, the T57S was sold via Continental Cars to a Mr J P Tingay in 1947. It was Tingay who effectively brought the car to ‘SC’ specification by fitting a Marshall K200 supercharger – as finding an original Bugatti blower proved nigh on impossible so soon after the War. 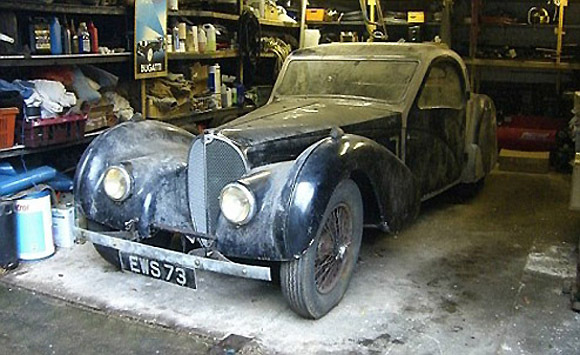 Mr M H Ferguson acquired the Bugatti from Tingay in 1950 and by 1954 it formed part of Lord Ridley’s collection. Dr Harold Carr then acquired it in 1955 from Lord Ridley. Dr Carr drove the car for the first few years but in the early 1960s it was parked in his garage where it remained for nearly 50 years, until Dr Carr’s death in 2007. The T57S is being sold on behalf of the family of Dr Carr, and will be offered with an extensive file of correspondence documenting its fascinating history. Two years after the introduction of Bugatti’s 1930s masterpiece the Type 57, the model evolved into its definitive form as the ‘S’ or ‘competition model’. Increased performance and a lowered centre of gravity created by running the car’s rear axle through the chassis, produced not only an out-and-out sports car, but a ground-hugging chassis line, ideal for creating the most wind-cheating and aerodynamic bodywork designs yet seen. Unquestionably the design for which the model is best known is the Atlantic coupe, in which form the model debuted at the Paris Salon in 1935 and it was further refined before production ‘S’s left the factory in September of the following year. By May 1937 when this chassis 57502 was delivered, the company could cite a string of international class speed records, and Grand Prix wins. These would be capped with a Le Mans win later that year. Historians state six racing or prototypes were built before production of the 57S began in earnest, but even throughout its three year run a mere 17 Atalantes were constructed. The streamlined Atlantic was carefully honed into a svelte coupe with the derived named Atalante, and this proved to be the design of choice to grace these chassis. However even a designated name didn’t mean uniformity as each car was handcrafted and as attested to today, each had its own particular style and detail. Francis Curzon, the fifth Earl Howe was synonymous with the best pre-war sports cars. A keen amateur racing driver who succeeded to the Peerage in 1929, he encouraged Dudley Benjafield to found the British Racing Driver’s Club and was elected its first President that same year. He retained this post until his death in 1964. A close associate of the ‘Bentley Boys’ after the marque’s retirement from racing he continued their quest for success in endurance racing, partnering Sir Henry Birkin in an Alfa Romeo to win the 1931 Le Mans, arguably his greatest achievement. As a successful competitor who could not afford to indulge his motor sport passion, he was surrounded by a wealth of friends and knowledgeable enthusiasts to guide him to the very finest and most suitable mount for a race, event or simply to enjoy the road with. That he owned a Type 57S says a lot, that he kept this very same car for 8 years, says even more….. These fabulous cars are coveted as much now as they were when new. The passion for collecting the 57S has passed from the luminaries of the 1930s, such as Malcolm Campbell to the great collectors of the twenty-first century, with the most passionate – Ralph Lauren among them – possessing more than one, and very few ever parting with them. The market supply is further diminished by the fact that a fifth of all production resides in the Musee Nationale de L’Automobile in Mulhouse, France including a quarter of all Atalantes built. Even within this thin air, chassis 57502 has characteristics which may well make it the most interesting of all the 57S cars, for as it stands today it combines an impeccable provenance with that most prized quality of total originality, having been virtually untouched and unused since the early 1960s.